"Aren't we all just stuck here in the middle?" 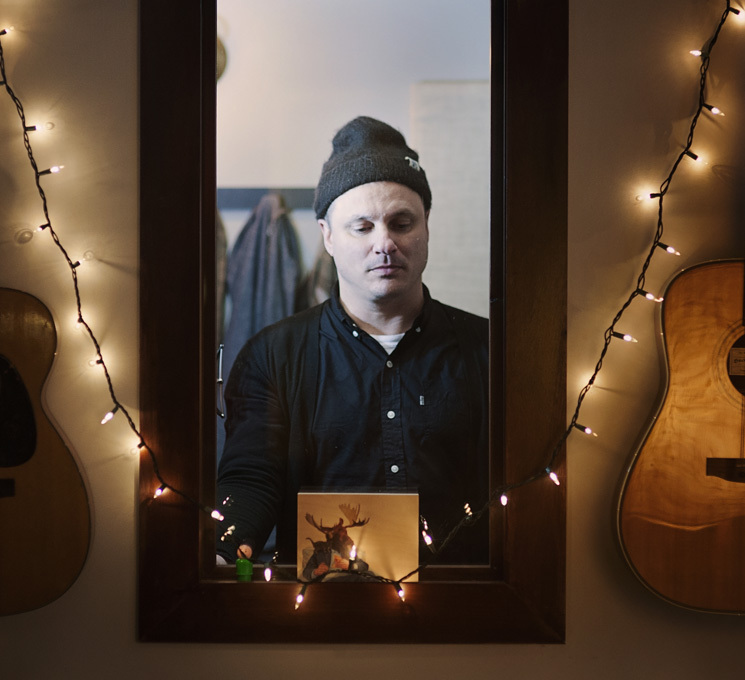 Jim Bryson asks on Somewhere We Will Find Our Place, his newly released fifth solo album amidst a busy career as a sideman and more recently a producer for artists such as Kathleen Edwards, the Weakerthans, Sarah Harmer and Oh Susanna. "Somebody said to me that they felt it was a contemplation on the middle years of life and the struggles and joy," Bryson tells Exclaim! about the album, from his home in Stittsville (just outside of Ottawa) that he shares with his partner and two daughters. "When I listen to [my] older songs, they were about breaking up or something. It seemed more one-dimensional to me. Somewhere We Will Find Our Place is sort of about the way life is and the way a week is. There are a lot of good things, and sadness, and struggle and joy." The working title for Somewhere We Will Find Our Place had actually been The Depression Dance, after the album's opening song, until Bryson got his cover art. "I thought it set it up to be a hot dance move," he jokes. But when Ottawa tattoo artist (and former pro skater) Julian Garner gave Bryson a painting called "Somewhere We Will Find Our Place," with a bird carrying a city on its back, the concept of carrying the weight of the world around from Bryson's song was in there. "He'd never done record art before," Bryson says. "It worked great." Bryson adds, "That song does deal with emotional fragility. I have OCD and so the thought of standing in one space and thinking about something for an extended period of time — there's a line, 'I stood there for so long, I stood there for so goddamn long' — it's a personal line, for sure. The way people are crippled and paralyzed by anxiety: I know how that feels." Produced by Charles Spearin (Do Make Say Think, Broken Social Scene), Somewhere We Will Find Our Place was recorded in three short bursts at different studios (Kingston's North of Princess, the Lincoln County Social Club in Toronto and the Bathhouse, as well as doing overdubs at his own Fixed Hinge). Bryson credits Spearin with being very macro: he was interested in the feel and the groove of the music, the big picture, the sound of the drums and the bass and how everything was going to work together. "I had always had a really big hand in my own records, and after I worked on Suzie [Ungerleider, a.k.a. Oh Susanna]'s record [Namedropper] I remember thinking, 'I want to have somebody as a producer on a record the way I've worked on other people's records — someone who was really hands on." It was also Spearin's idea to get Shawn Everett (Alabama Shakes, Weezer) to mix the album, imbuing it with a lot of distortion, saturation and tension. Though they've never met, Bryson credits Everett as being a creative part of the record, changing how it sounded and adding intros and breakdowns to a few songs. "On songs like 'The Depression Dance,' 'Changing Scenery' and 'Call Out' there's a lot of vocal distortion, and that was not us recording — that was Shawn's mixing," Bryson says. "People say it feels urgent and almost uncomfortable, relentless, like things are broken. The more I listened to it, the more it made sense." Because Everett was busy with Alabama Shakes, mixing took a long time. "I waited five months to get my first mixes," Bryson says. "At some point it's part of why I'm so okay and comfortable with [pushing the release date back] by two or three weeks. "I've never cared more, and been more casual about music. I think recording is a snapshot of a time in your life and that's why it's called a record — it becomes the public record of that time of your life, should you choose to be yourself. What some people like, and some people think there's not a lot of mystique to, is there's not a lot of difference between me talking to you and me playing music. I'm not smart enough to have a persona," Bryson jokes. So when he sings about coping with depression, Bryson's singing as himself. "I'm not the only one that feels that way, obviously. Part of coping with emotional scenarios is you don't feel like an island." Check out the new video for "The Depression Dance" below. Somewhere We Will Find Our Place is out now on Fixed Hinge/Fontana North.